Remember when IDC and other large research firms tracked PC shipments. 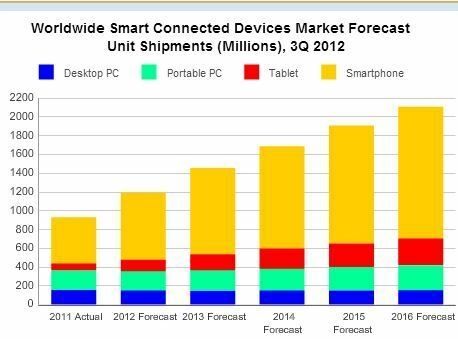 Well, they still do, but for its part, IDC is starting to track the “worldwide smart connected device” market which now humbly lumps PCs into the booming market for smart phones and tablets. If you needed any evidence that BYOD is not going away next year like a few pundits have said, chew on this: IDC projects the sales of 717.5 million smart phones in 2012 or about twice as many PCs, both portable and desktop. The gulf will widen in 2016 when 1,405.3 million smart phones versus 419.8 desktop and portable PCs. Enterprise CIO Forum IDC, portable PCs, tablets. permalink.